Call today for massage services! Did you know that 8 out of 10 Americans suffer from back pain? One of the best ways to help ease that pain is with a massage. Whether you're thinking that you need a sports massage or Reiki, Arias Spa is here to help. We are proud to serve the Manchester, NH area. Give us a call today for information about our massage services. Massage therapy is the careful manipulation and the handling of soft body tissues such as tendons and ligaments. A massage can be applied to help enhance a person’s health and to eliminate the pain. There are many types of massage that can be applied for various types of chronic pain and with our help, you can live pain-free. If you've been experiencing pain, discomfort, headaches, or anxiety and you're looking for a natural, relaxing solution, massage therapy may be the answer. There are many types of massage to target your specific needs. Choose between sports massages, Reiki, deep tissue massages, and more when you book your Manchester, NH massage appointment. Many of our patients suffer from chronic pain in the hips, back, shoulders, or even their heads. Massage treatment helps target those problem areas by putting your body back into its proper alignment. When you visit our fully licensed professional for massage therapy, Reiki treatment, aromatherapy and more, you are taking the first steps towards total body health. From chair massages for your office workers to sports massage to address problem areas specific to atheletes, you know you've come to the right place when you call Arias Spa. Arias Spa is your premier massage treatment and massage therapy provider in Manchester, NH. Andrea Kuhman is a fully trained massage therapy professional who completed her education and training with the highly acclaimed New England Academy of Therapeutic Sciences. She is nationally certified and is fully licensed as a Massage Therapist by the New Hampshire Board of Massage Therapists. Whether you need sports massage services, are interested in Reiki or other forms of massage, she can help. We offer reiki, sports massage, & other types of massage! Andrea Kuhman specializes in a wide range of massage services including Shiatsu and Sports Massage. Your massage goals and needs are her top priority and she will work closely with you to implement a form of massage therapy most suitable for your needs. Here at Arias Spa we utilize the latest methods in exceptional massage and utilize high quality products like Melaleuca that harmonize both your inner and outer health benefits. We offer a variety of holistic healing services including Reiki, meditation, energy balancing, aura cleansing, and more to help you feel your best. Our Manchester, NH holistic center is focused on helping you feel better physically, emotionally, mentally, and spiritually. Reiki energy allows muscles to relax and increases blood flow to treated areas, which in turn quickens the healing process. Practitioners and clients report help with stress, headaches, insomnia, upset stomach, sprains and other minor conditions. Reiki is a Japanese practice that relieves stress, tension, and pain. It is based on the idea that each of us has a "life force energy" that flows through us at all times. If our life force energy is high, we are happier and healthier - if it is low, we will feel tired, sick, or stressed. Our Reiki therapist uses hands-on-healing to activate your body's natural healing processes. This in turn helps to restore emotional and physical health. Although Reiki is not a substitute for conventional treatment for diseases or seriousness illness, it can help promote general mental or physical well-being. If you're interested in trying Reiki, Arias Spa can help. There are more than one benefits when it comes to the technique of Reiki. Our certified therapists have years of experience helping people with various health issues in Manchester, NH and the surrounding areas. Not only does it help you with physical wellbeing but also stimulates relaxation to work as the perfect stress buster. Our therapy can help you deal with pain resulting from an injury and also speed up your healing. Contact us today to learn how Reiki can help you. Massages offer a variety of health benefits to clients. Depending on what your goal is, we can suggest a massage service to meet your needs. If you're interested in Reiki or sports massages, Arias Spa is the place to be. In Manchester, NH, no other massage spa delivers high-quality, customer oriented services to meet your needs. For more information on the massage services listed above and for pricing and massage therapy information, please feel free to visit our website. Whether you need a small foot massage, sports massage or want to head to the spa for a relaxing deep tissue massage with your loved one, we have just what you need at a price you can enjoy. 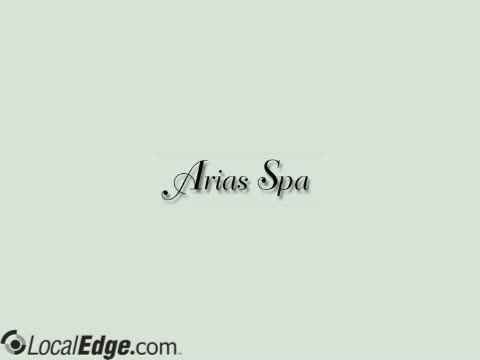 Arias Spa is located at 70 Randall in Manchester, NH. Andrea Kuhman is a massage therapy professional and has the years of experience and training to provide you a most relaxing, soothing and pain-relieving experience. When it comes to a most fulfilling massage you can count on Arias Spa. Arias Spa is your premier massage therapy provider serving the greater Manchester, NH area! Stop on by or call (603) 494-9102 to learn more about our excellent massage services. Got arthritis? Suffering from an injury? Want to take a load off and relax? We’ll help and provide a most enjoyable massage experience just for you! Reflexology Foot Spa Treatment 60 min. $75, add the hands for an additional $10 Experience the ancient art of foot reflexology that focuses on reflex points improving circulation and triggering equilibrium. Your feet will enjoy a therapeutic aroma scrub, a de-stressing Reflexology foot massage and a soothing paraffin wax treatment. Hand, Foot and Scalp Ritual 60 min. $75 It is proven that massaging the hands, feet and scalp induces total relaxation. This treatment features a medium-to-firm pressure massage for hands, feet and scalp, complemented with your choice of aromatherapy in conjunction with soothing foot lotions. On-Site Massage 60 min. starting at $75 our trained therapists will come to you in the comfort of your own home to provide you with a Relaxation, Therapeutic, Expectant Mother, or Deep Tissue massage. We provide on-site therapeutic chair massage services across Southern New Hampshire. We can bring our skilled and professional massage therapists to your office, party, special event or trade show convention booth seamlessly Call for pricing. No walk-in's. Appt only. WE NOW ACCEPT BENEFIT CARDS !